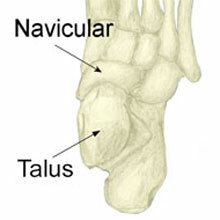 The sinus tarsi is a small bony canal which runs into the ankle under the talus ankle bone. Damage to the sinus tarsi can be caused by overuse or an ankle sprain. It normally causes pain and tenderness near the bone on the outside of the ankle, which is often exacerbated by running around a curve. Read more for the symptoms and treatment of this ankle injury. Symptoms of Sinus tarsi syndrome typically include pain which may difficult to pinpoint but somewhere just in front of the bony bit or lateral malleolus on the outside of the ankle. Tenderness will be felt at the opening of the sinus tarsi which is located on the outside of the ankle. The patient may have pain or difficulty running on a curve on the side of the painful ankle, for example, running around a left-hand bend running track if the left foot would be painful. Inverting the ankle or moving it into a position where it is turned inwards as it would go with an ankle sprain may cause pain with Sinus tarsi syndrome. An anesthetic injection into the painful sinus tarsi will confirm the diagnosis by relieving pain and allowing normal function. An MRI scan may indicate excessive fluid in the sinus tarsi canal. Rest from all painful activities. Continuing to train on a painful ankle will make the injury worse or at least prevent healing. Apply ice or cold therapy to reduce pain and inflammation. Cold can be applied for 10 to 15 minutes every hour initially if the injury is very painful but reducing later to 3 or 4 times a day as required. A doctor may prescribe NSAID’s or nonsteroidal anti-inflammatory drugs such as ibuprofen (don’t take if you have asthma). Electrotherapy such as ultrasound may help reduce inflammation and swelling caused by sinus tarsi syndrome. Mobilization of the subtalar joint is an important part of treatment and rehabilitation. A professional therapist or trainer should be able to help with ankle mobilizations for sinus tarsi syndrome. Correction of any biomechanical problems such as overpronation. Overpronation is when the foot flattens or rolls in too much. This could change the way the ankle bones move restricting the space in the sinus tarsi channel. A podiatrist or similar can prescribe orthotic insoles which go in shoes to correct biomechanical foot problems. It is important to have the correct running shoes for your type of feet also. Strengthening exercises for the ankle especially proprioceptive exercises such as the use of a wobble board. If you have been out of training on an injured ankle then the proprioception or co-ordination of the ankle will be disrupted. Balancing exercises and using a wobble board can strengthen the proprioception and make re-injuring the ankle less likely. Stretch the calf muscles at the back of the lower leg. Tight calf muscles may affect the biomechanics of the ankle.